THE IRISH WING of international jobs site Indeed has hit a snag as it fine-tunes the development of its new offices on St Stephen’s Green. The US multinational opened its EMEA (Europe, Middle East and Africa) base in Dublin nearly six years ago. Since then, revenues at the Irish firm have surpassed the €208 million mark, although it continues to post losses as it expands its workforce. Three years ago Indeed announced plans to relocate to the old headquarters of the Bank of Scotland in Ireland near Grafton Street to accommodate rising staff numbers. There are now roughly 750 staff based out of its new premises facing St Stephen’s Green, which had its grand opening last year. Indeed also applied for planning permission in June to place an illuminated company logo inside the premises on the ground floor level. The 8.4m x 2.45m sign has already been installed and faces out towards St Stephen’s Green and the Luas tracks. Indeed noted in its planning application that the sign would be a “positive contribution to the streetscape”. However, since the first application, Dublin City Council has refused numerous attempts by the firm to secure permission for the sign. The planning authority deemed Indeed’s first application invalid because the company’s name was spelled incorrectly on some documentation submitted and the wrong address was also included on some forms. It was also refused by the council because the firm did not pay the correct €420 fee for the planning request to be reviewed. In June, Indeed addressed the issues raised by the council and lodged the planning request again. In its ruling on the second application, the council said it has “serious concerns” about the signage since the building is located within the conservation area around St Stephen’s Green. It added that the ”stark white” sign would “read loud” on the surrounding area, adding it was not an appropriate design. 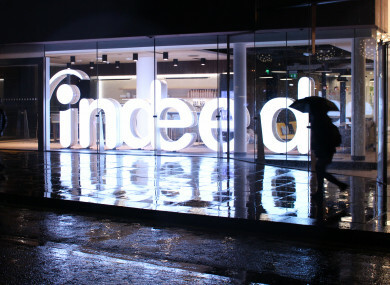 The council asked for further information about the development from Indeed but the firm withdrew its planning request. In October, Indeed made another application to the council and asked for clarification if the erection of an illuminated advertisement at the office is, or is not, a development and if the sign is exempted from the planning process. Dublin council refused Indeed’s request for an exemption certificate. Last month the firm appealed the local authority’s decision to An Bord Pleanála to try and reverse the council’s decision. Fora contacted Indeed but the firm said it had no comment to make on the matter. A decision from An Bord Pleanála is expected in the coming months. Dublin council has a number of regulations in place to control the development of illuminated signs in the capital. Signage for any commercial unit on the ground floor should be mounted on the business’s fascia. The authority’s rules also state that internal signage in a premises which obscure views into a commercial unit are not permitted. Corporate signs are only permitted if the council has deemed they are compatible with the character of the building and those of adjoining buildings. Email “Job search giant Indeed is locked in a six-month fight with Dublin council over an 8ft sign”. Feedback on “Job search giant Indeed is locked in a six-month fight with Dublin council over an 8ft sign”.